Becoming rich is one of the most desirable dream of a person but becoming rich is very difficult task.There are many ways to be among the millionaires and Blogging is the finest way of doing that.It not only makes you popular but it also generates handsome amount of revenue via Affiliated advertising.If you owns a Blog which have good loyal visitors there is very high chance you might get sponsors for your Blog.All you need to do is to place advertise here slot and if any one liked your site the chances are very bright that he might advertise on your website that how you can earn a lot.Most of user use buysellads.com to advertise on there site but to become buysellad.com partner your Blog must have atleast 100000/monthly page views so its better to start your own organization the reason today we will learn How We can Add Advertise Here Ad Slot of 125 By 125 In Blogger. 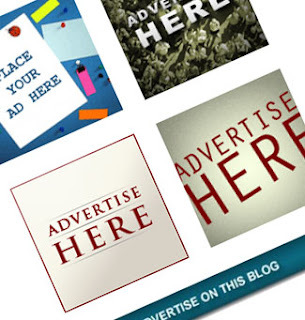 To insert Ad slots just like above simply copy this code bellow and paste it where ever you want to display Ad Slots on your blog.You can place it in your sidebar,above your posts or even at the end of your posts. Replace ADVERTISER-URL-HERE with the website like of your advertiser. Replace IMAGE-BANNER-URL With the Image link of your advertisers banner. If you want to Add two more ad slots i.e Six Slots simply add the following code before </tbody></table> in the code above.Repeat the same process to add two more i.e Eight Slots keep on repeating until you reach the desirable results. i tried it again,i entered the advertiser's website in the "advertise url" but if i click on it,the address on my computer shows my blog address/the advertisers add and then it says "sorry page not found on this blog" i also entered the link for an image,still it shows no image.pls help me!!!!!!! !